Set in the waiting room of a dentist’s office in the oppressive heat of a New York City summer, Rocket To The Moon focuses on the midlife crisis of Ben Stark, an unhappily married dentist who encouraged by his father-in-law, a man dealing with his own frustrations in life, to pursue his own dreams. This leads him to have an affair with his new dental assistant, the luminous Cleo Singer, which starts off as a bit of fun but soon turns into something much more profound in the latest show to open at the Lyttelton. As Stark, the handsome (and finally released from Coney Island) Joseph Millson is excellent, his nervous smile betraying his emotions all-too-easily as he struggles to balance his moral position with his desire to follow his heart and even as he tumbles for Cleo, he still maintains a certain integrity to the character which is most involving. And making her theatrical debut after a well-received television career, I was quite impressed by Keeley Hawes in the rather thankless role of his highly-strung wife. She managed to bring some humanity to this woman Belle suggesting that she is as much a victim as Ben, even if Odets doesn’t allow her character that much development beyond that of the exceedingly demanding, a heartbreaking moment as she closes the door on her husband encapsulating her performance beautifully. But though it is Hawes’ debut, it is Jessica Raine as Cleo who emerges as the star of the show. I’ve followed Raine for a couple of years now and she is an actress who really excites me and she does not disappoint here in creating a character who seems as ditzy as anything as we first meet her but she slowly reveals the layers to this rather complex young woman looking for a better life so that the emotional climax makes perfect sense. I also enjoyed Nicholas Woodeson’s frustrated showman Mr Prince and Ben’s 2 colleagues, a ruminative turn from Sebastian Armesto and a quietly powerful yet moving performance from Peter Sullivan. Anthony Ward’s set design is nicely realised, with a long corridor stretching back deep down the left hand side meaning that the ripple of anticipation, as a character walks up to get to the main room, slowly moves from left to right in the audience as the people sat on the left see them well before people sat on the right hand side. And credit should go to Rebecca Elson’s costumes which looked just right and gave Hawes’ in particular some lovely dresses and nifty millinery. 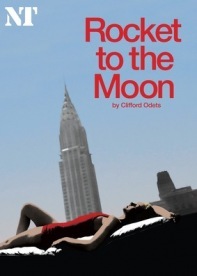 Rocket to the Moon is something of a slow-burner but well worth it in the end, as Odets’ portrait of an individual struggling to reconcile personal responsibility and ambition, to rise above his circumstances is powerfully moving and excellently portrayed in Angus Jackson’s production here. 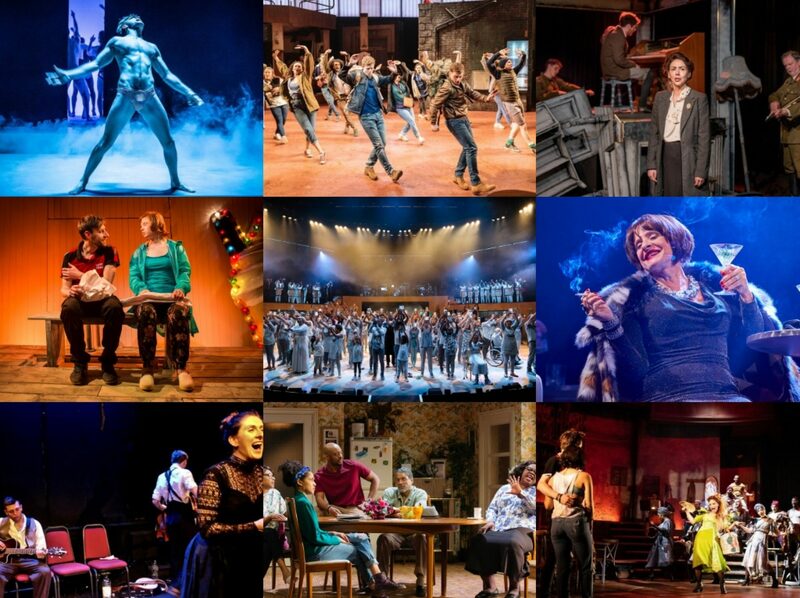 The only thing that concerned me was how very little the four ensemble members got to do throughout the show! Sitting among a group of New Yorkers at this production was interesting – they found the accents (which admittedly require work) so jarring that two of them left at the interval unable to take it any longer. The New York drama student sitting next to me said it was the worst production of Odets that she had ever seen. My question is why is our National Theatre (no longer a centre of excellence I fear) producing a second string play – Odets wrote much better drama than this. As to this production – there was no atmosphere at all, it is a heat wave in New York at the end of the Depression – all we get is words words words never a whiff of why everyone is full of angst – the relationships have not been resolved satisfactorily – thus a mediocre play is offered in a vacuum which renders it just short of tedious – all in all a pretty disappointing, disillusioning evening. Maybe the Arts Council should take a look at the level of grant! Not a whiff of Poor Theatre here!! !